Boasting some of the most breathtakingly beautiful scenery in Canada, Saskatchewan is a paradise for lovers of the great outdoors and eco-tourists. It features everything from world-class fishing, kayaking, and hiking, to hunting, horseback riding, and wildlife spotting in the wilderness. Saskatchewan's capital and second largest city, Regina, is the original headquarters and birthplace of the famous Royal North-West Mounted Police, affectionately known as Mounties. Saskatchewan is made up of prairie in the south, while the north comprises boreal forest, rolling hills, and the majority of the province's 100,000 lakes. Europeans first discovered the land in 1690, with the province now boasting a rich Scottish connection and even provincial tartan. Saskatchewan proudly educates others on its history, with its 250 or so museums covering the stories and cultures of indigenous tribes like the Sioux, Saulteaux, Athabaskan, and Cree. There are also cultural landmarks and more urban things to do in the city of Saskatoon, which is a centre of nearly 250,000 people. The site of the North-West Rebellion's Battle of Batoche remains a top tourist attraction, as does the Cypress Hills Interprovincial Park. However, most visitors to Saskatchewan come to get away from it all and enjoy the clear skies, wildlife, and peace and quiet of the wilderness. 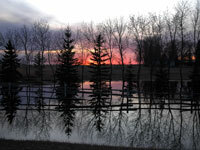 However, travellers must come prepared for the climate as Saskatchewan experiences both some of the highest and lowest recorded temperatures in Canada. Northern Saskatchewan has a subarctic climate. Temperatures range from highs of 79°F (26°C) in the summer to an average of 0°F (-18°C) in the winter.